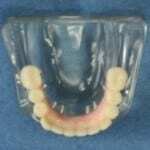 Sometimes a patient has been wearing dentures for so long that their mouth is a disaster. Their face has sunken in, their dentures barely function, and it is nearly impossible to eat. This is the result of the bone atrophy commonly known as facial collapse. If you’re in that situation, hybrid implants may be a good solution for you, because they replace your missing teeth and gums, as well as the bone in your mouth. The hybrid is anchored to your mouth using dental implants. 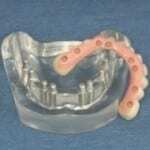 It is called a hybrid because it is kind of a crossover restoration – it isn’t a denture with a wide pink acrylic flange that rests on the tissue, and it isn’t crowns that have just teeth. It has pink restorative material that simulates missing gum tissue and is solidly anchored to your bone. Left: What the implants look like. There are basically two types of hybrid implants: Fixed hybrids and removable hybrids. Both types will be anchored by from six to ten dental implants. While they replace missing gum tissue, they don’t rely on any tissue support but are entirely supported by implants. This makes them very comfortable and natural-feeling, besides being very stable. Screws, hidden inside the teeth, anchor the restoration to the implants. The screws are then covered over with resin so that they are completely invisible and inaccessible, though they can be retrieved by a dentist. These will usually be anchored by fewer implants and are easier to remove and replace. If you’ve lost bone structure because of years with dentures and would like to see if you’re a good candidate for hybrid dentures, you may call our office to schedule an appointment, or click here to request an appointment online.